As much as I enjoy free city walking tours, they don’t come with food. Serious talk. Especially when you’re walking for 3+ hours. 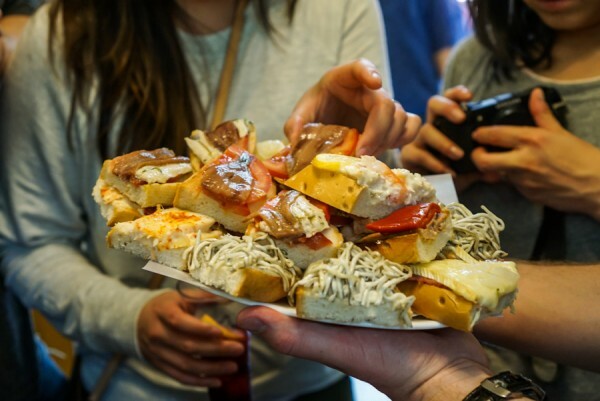 That’s why we genuinely enjoy food tours. It’s nice to know there’s a little tasty morsel waiting for you just around the corner. Plus this way, it’s two birds with one stone — you get a good introductory, not to mention delicious way, to a new, foreign city you don’t know much about. 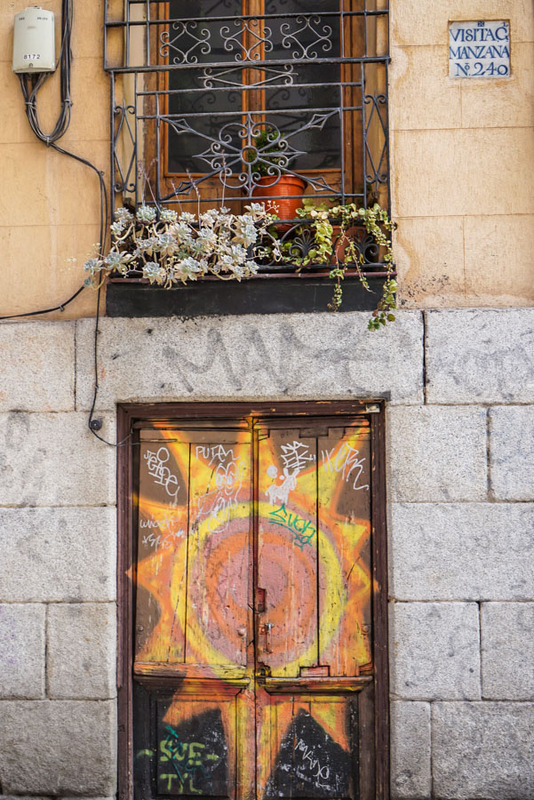 We arrived at the eclectic and colorful neighborhood of Huertas. 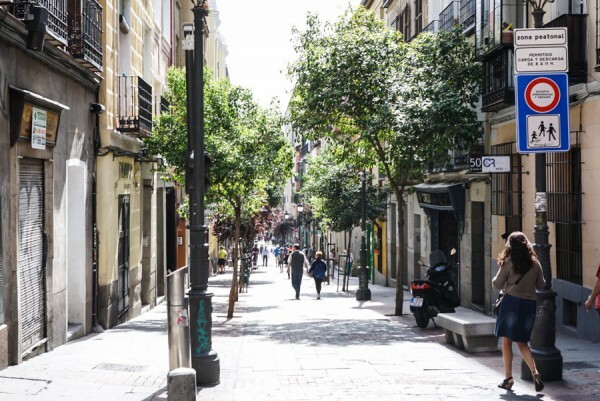 Lined with cobblestone streets and pretty architectural buildings with matching patios, it definitely has its charm. Also known as the “literary quarter”, I can see why writers, old and new, flock here. Okay, note of advice: when they tell you tour starts promptly at 10:30, they’re not kidding. We came a little late and the gang was gone. Fortunately, we had the email confirmation which instructed if you’re going to be late, here is the address to meet us at the first location. Panic was avoided and we made it just in time for breakfast: churros con chocolate. When I think of breakfast, sweets aren’t usually the first thing that comes to mind. Well not here, not in Spain. Who ever thought that deep fried dough and a cup of rich, dark chocolate would be a good combo for breakfast is a genius. G got hooked on these quick and craved for them every morning. Part of the neighborhood tour means you get to meet local artisans and taste hand-crafted treats such as jams, olive oils, potato chips fried old school and cheese. We also visited the local market where I would imagine most merchants in the area get their fresh produce from. At the market, we got to sample our way around the market. First up, olives. 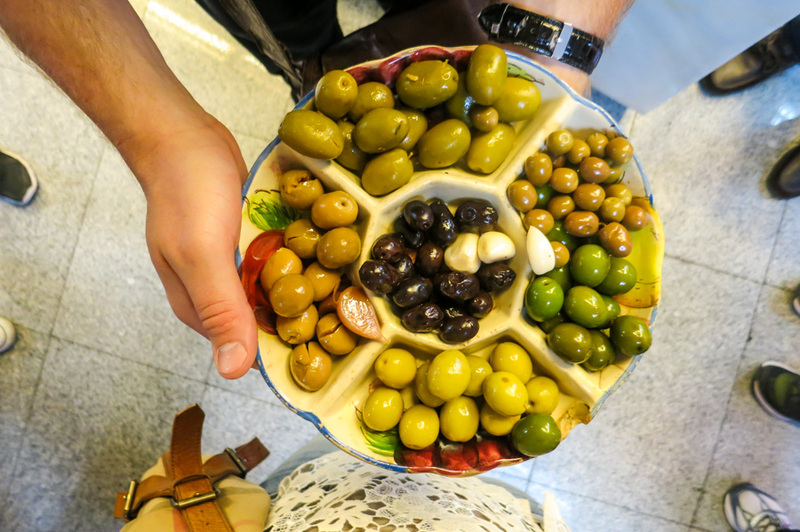 I have to say, for two people who hate — and I really do mean hate — olives, we were close to saying no on this part of the tasting, but we did not want to be rude. After all, when in Rome. Err, I mean Spain. And you know what? Not half bad. Most just didn’t suit our palettes but a selected few were surprisingly tolerable. Oh, but shout out to those pickled garlic cloves.. so good! Olives aside, I could not believe the amount of food we were being fed here: porchetta tapas, crab pate, slow-cooked beef tongue and, of course, the piece de resistance — Jamon iberico! 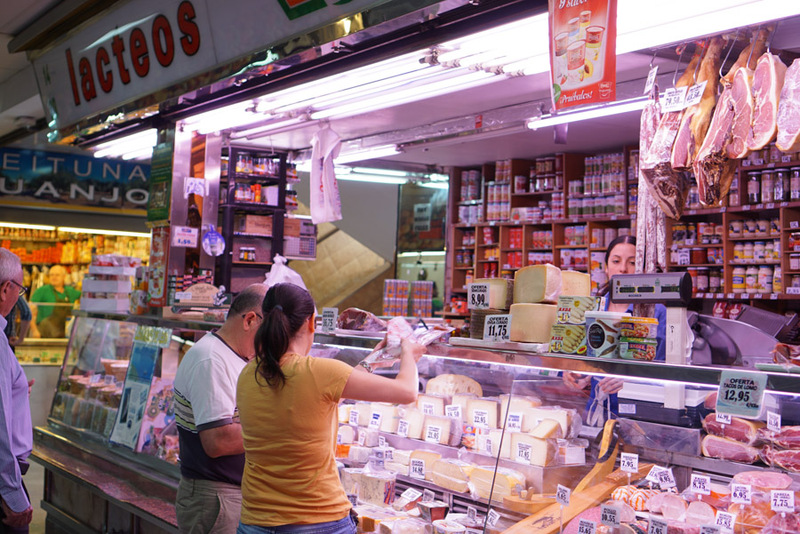 Lots and lots of jamon. I left the market stuffed but Luke just had to remind us dessert is yet to come. Just up the road we had classic Spanish cheesecake waiting for us and a mountain of tapas of our choice. I went for anchovies, of course. Finally, we washed it all down with a traditional vermouth which taste like an extra sweet flat Coca Cola. I kid you not when I say, we ate Madrid. I think we were good until late dinner, that’s how contently full we were. The best part for us, interestingly enough, the start with churros for G and the end with anchovies for me. Although let’s not discount everything in between was equally delicious as well. Yes, even the olives. Well, some. 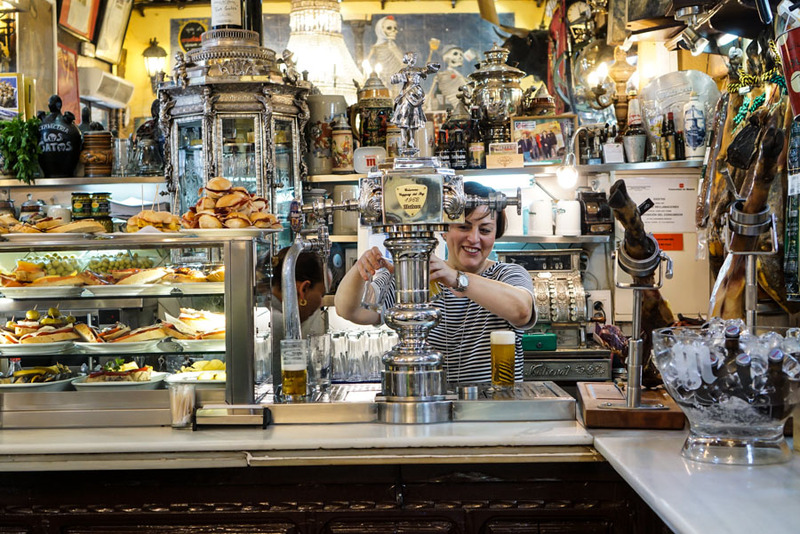 What’s a Madrid food favorite of yours you can’t get enough of? 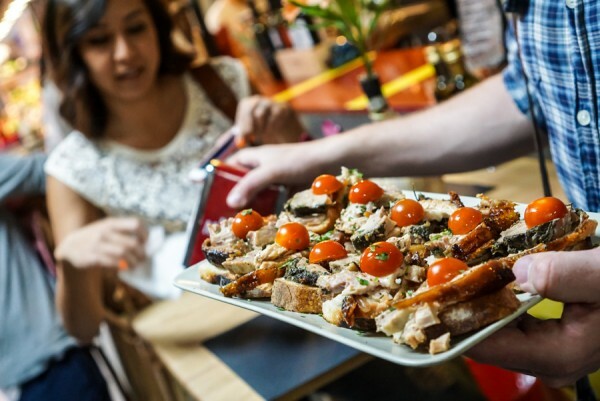 If you’re in other parts of Spain, Devour Spain Food Tours is also in Barcelona, Malaga and their newest location, Seville. 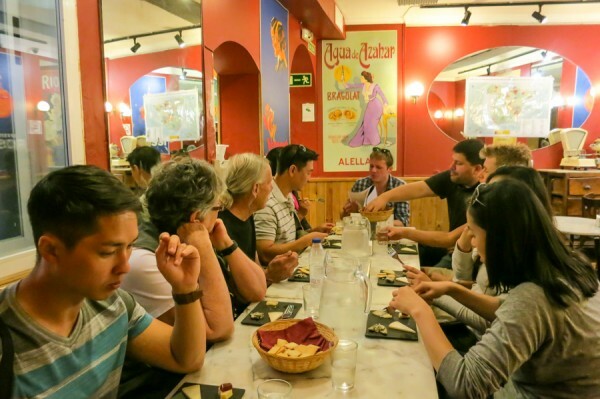 – Muchas gracias Madrid Food Tour for hosting us. Though our tour was complimentary, as always, all delicious opinion are my own. 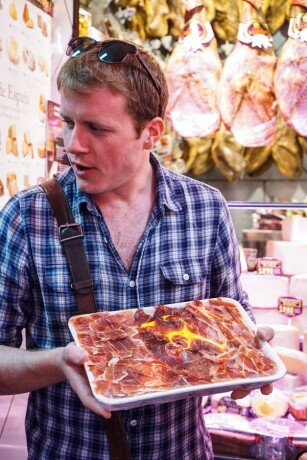 Seriously, despite all the perfectly sliced Jamon iberico. Not even Luke, our guide, with his cute English accent persuaded us otherwise. Thanks for joining us in Madrid guys and awesome meeting with you in Seville! 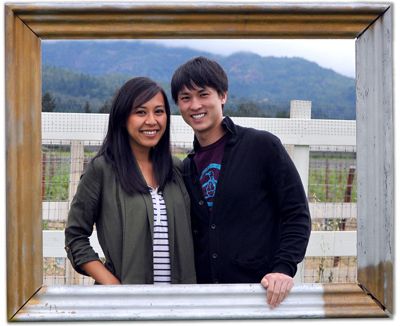 Hope to see you in California next time– lots to be eaten there! This has my stomach growling. I LOVE all of that food and I adore food tours. I love paella – that’s one of my faves from Spain. Paella…. the main reason I want to go to Spain! Gahh!! I KNEW we needed more time in Spain. Don’t think we had the proper paella experience. 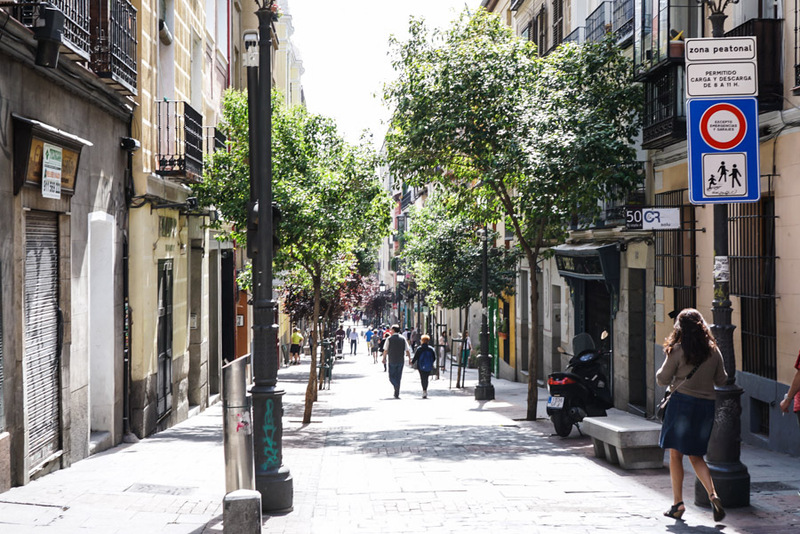 Well, all the more reason to come back — I’m already experience Spain withdrawal. 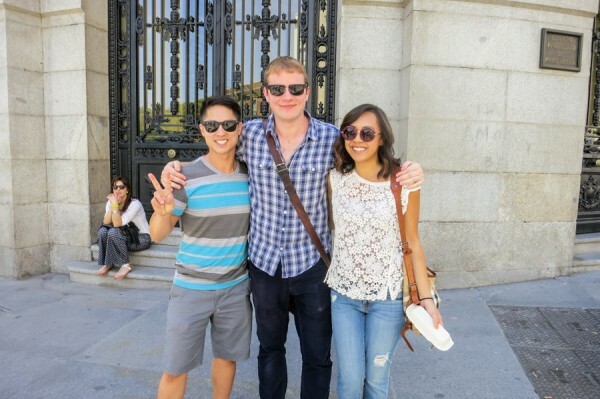 I ate my weight in churros con chocolate and jamon during my time in Madrid! I wish I had taken a tour like this there. So delicious! I went on an Eating London tour and know what a great job they do. Adding it to the list when I return to Spain! 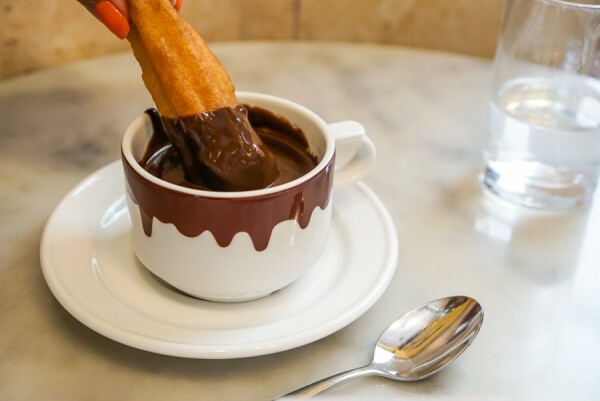 I think starting the day with churros con chocolate is perfectly acceptable. Everything on the tour looks/sounds incredible! I think I need a nap just reading this. Looks like a delicious intro to the country.